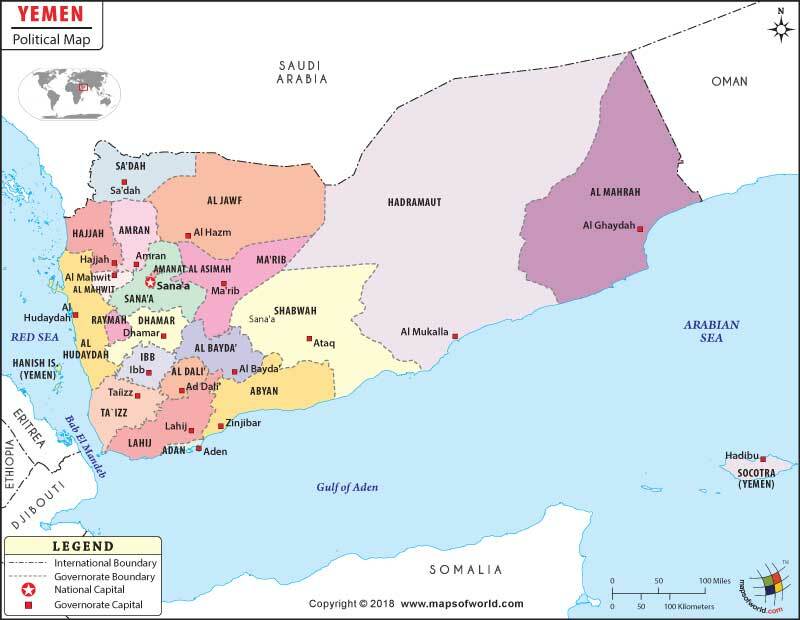 Yemen is located in the Middle East, occupying the southwestern to southern end of the Arabian Peninsula. It is bordered by Saudi Arabia to the north, the Red Sea to the west, and Oman to the east. The flag of Yemen was adopted on May 22, 1990. The Flag consists of tri colored Strips in which Red stands for the bloodshed of martyrs and unity; the White for a bright future; Black for the dark past. The history of Yemen goes back to very early civilizations, including the Kingdom of Saba as far back as the first millennium BC, assumed to be the Biblical land of Sheba. The region was divided into several tribes, such as Qataban, Aswan, Ma'in and Hadhramaut. Saba was united and ruled by the Mukarrib, or priest king, and expanded the kingdom's territory. The kingdom divided into the Hamdan and Himyarite Kingdoms, and the latter found support with the Kingdom of Aksum to gain power, and conquering much of the region by 275 AD. The last monarch of the Himyarites was Dhu Nuwas, who was Jewish, and fought with the Christians across the Red Sea in Aksum in 523 AD. In the 6th century, Islam arrived in Yemen, and it was soon ruled by a series of Islamic caliphates, and became part of the Islamic empire. By the 10th century, Yemen was ruled by the Zaydi Imams with the Rasulid dynasty, but attempts by Egypt and the Portuguese to take control threatened Yemen's sovereignty. In 1538, Yemen was conquered by the Ottomans, who wanted the region as a strategic point along the routes to Mecca for its religious significance and India for its importance in trade. The British East India Company took control of Aden for similar reasons in 1832, and the Ottoman Empire and British Empire established their territories, with the Ottomans controlling North Yemen and the British ruling the south. The Ottoman Empire ruled North Yemen until its collapse, when North Yemen gained independence in 1918, under the leadership of the Zaydi imam. South Yemen remained a British protectorate, known as the Protectorate of South Arabia. The Yemeni people in the south began to revolt against British rule, and after major uprisings in 1967, the British were defeated and South Yemen became the People's Republic of South Yemen. By 1970, however, it became the People's Democratic Republic, and by 1972 the two parts of Yemen were united, though the unification was not entirely peaceful. Conflict arose in 1979 and again in 1986 with civil war between opposing powers. Unification became official as the Republic of Yemen was declared in 1990. Another civil war broke out in 1994, and the 2000s saw the rise of Al Qaeda groups in Yemen. Issues with rebel groups have continued to occur, including during Arab Spring protests in 2011. Yemen shares borders with Saudi Arabia and Oman, and is across the Red Sea and Gulf of Aden from Africa's Eritrea, Djibouti, and Somalia. Located on the southern edge of the Arabian Peninsula, Yemen sits at a crucial location between Asia and Africa, and the gateway to Europe. The strait of Bab-el-Mandeb separates Yemen from the African nations of Djibouti and Eritrea, and is the passageway between the Gulf of Aden and the Red Sea, which provides a sea route for ships traveling to Europe via the Suez Canal. In addition to Yemen's hot and dry coastal plains, called Tihamah, along the Red Sea, the terrain of Yemen features deserts and the Haraz Mountains. Much of Yemen sits at a high elevation, with its highest point atop Jabal an Nabi Shuayb, standing 3,666 meters (12,028 feet) above sea level. In the northeast is Yemen's portion of the Empty Quarter, a major desert covering much of the southern Arabian Peninsula. The region in general is very dry, but there are fertile regions in western highlands in which crops can be grown. Though Yemen does not have any permanent rivers, when it rains its river valleys, known as wadis such as Wadi Hadhramaut, flow to the sea. Most visitors to Yemen will head to the capital, Sana'a, which is home to the old town, Babel Yemen, and Dar al-Hadschar Palace, the rock house. The old town of Sana'a is a designated UNESCO World Heritage site for its historical value, with quaint architecture and incredibly old sites. Outside of the city, there are many more historic sites, including the fortress of Kawkaban, which offers architecture from the Himyarite kingdom. In Ta'izz, once a Yemeni capital, visitors will find a relatively progressive city with medieval architecture, at the foot of the mountains. Ma'rib was home of the Biblical Kingdom of Sheba and the home of the Queen of Sheba. Natural attractions in Yemen include the protected region in Bura, which is home to lush forests and endemic plants and animals. Hauf National Park features mountain forests and greenery along the border with Oman. Al Khawakhah is one of the world's hottest places, but is fortunately located along the beach, lined with beautiful palm trees. The city of Al Mukalla is also located along beaches, including the nearby Bir Ali, one of the best in the country. The main airport in Yemen is Sana'a International, located in the capital. The airport offers frequent service into Dubai, Cairo, and other regional destinations. Entering Yemen by car for bus is possible from Oman and Saudi Arabia, but the latter can pose challenges for vehicle permits and tourists will have challenges traveling between eastern and western Yemen. Ferries are a viable option for transportation from Djibouti, with fairly inexpensive options. Though roads in Yemen have improved, many regions do not have an established road network and can be quite difficult to get around. Fortunately, buses and taxis are available around the cities, and drivers can be hired for travel between cities. Shared taxis can be found in every city, which is less comfortable but quite inexpensive. Tourists must request a travel permit from authorities within Yemen when leaving the capital, which is for the safety of the travelers due to dangerous regions.